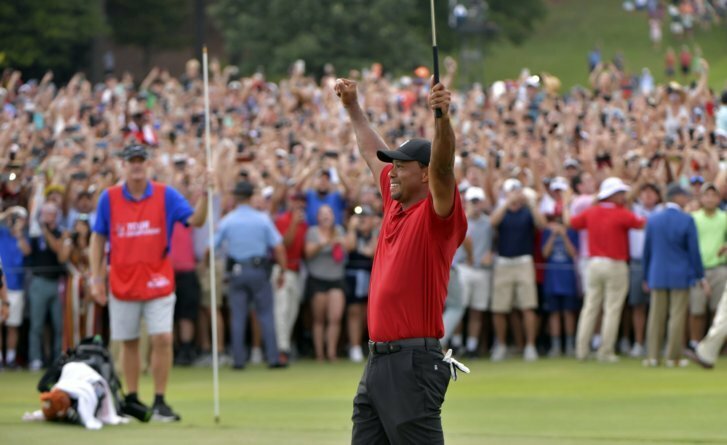 All that was left was the 42-year-old Woods in that Sunday red shirt blazing brighter than ever and a smile he couldn’t shake walking up to collect another trophy. He finished at 11-under 269 and won $1.62 million, along with a $3 million bonus for finishing second in the FedEx Cup. The only disappointment — a minor one under the circumstances — was realizing as he came down the 18th that Rose had made birdie to finish in a three-way tie for fourth, which gave him the FedEx Cup and the $10 million bonus. Without that birdie, Woods would have won his third FedEx Cup title after starting at No. 20 going into the Tour Championship. Rose’s four bogeys over the last 10 holes cost him the No. 1 ranking back to Dustin Johnson, who shot 67 and finished third. Stricker also won in Arizona and Mississippi in consecutive starts in May for his first senior victories. Next week in France, he will be one of U.S. Ryder Cup captain Jim Furyk’s assistants. VILAMOURA, Portugal (AP) — Tom Lewis won the Portugal Masters for a second time, shooting a 5-under 66 for a three-stroke victory over fellow Englishman Eddie Pepperell and Australia’s Lucas Herbert. Lewis finished at 22-under 262 — following an opening 72 with rounds of 63 and 61 to get into contention. He won the 2011 tournament for his only other European Tour title. Yuta Ikeda closed with a 3-under 68 for a six-shot victory over Justin Harding in the Asia-Pacific Diamond Cup, a co-sanctioned event on the Japan Golf Tour and Asian Tour. It was his first victory this year, giving him at least one victory in 10 consecutive seasons. … Romain Langasque of France rallied from a two shot back with a 5-under 67 for a three-shot victory over Joel Sjoholm and Joel Girrbach in the Provence Open on the European Challenge Tour. … Marcelo Rose of Colombia won the PGA Tour LatinoAmerica’s Brazil Open. He finished with an 8-under 63 for a one-stroke victory over Harrison Endycott and Chase Hanna. Kendall Dye won the Guardian Championship in Prattville, Alabama, for her second Symetra Tour victory of the year and fourth overall. The former Oklahoma star closed with a 6-under 66 to finish at 16-under 200. Ruixin Liu and Min Seo Kwak finished a stroke back. … Anne Van Dam capped off an eight-shot victory with a 6-under 65 in the Estrella Damm Mediterranean Ladies Open in Spain on the Ladies European Tour. The 22-year-old from The Netherlands had rounds of 64-64-65-65 at Terramar GC to win over Solheim Cup players Caroline Masson and Caroline Hedwall, and amateur Selin Hyun. … Lim Kim closed with a 5-under 67 for a two-shot victory over Jeong Eun Lee in the Se Ri Pak Invitational on the Korean LPGA Tour. … Kaori Ohe closed with a 3-under 69 for a two-shot victory in the Miyagi TV Cup Dunlop Women’s Open on the Japan LPGA.